Every year, my family tell me they don't know WHAT they're going to get me, and every year we have a great big laugh about it. But every year I think ah, THIS is the year. This is the year when they DO know what to get me, but they're all PRETENDING they don't. They're all conspiring with each other, pooling their money and resources, going that extra mile to get me the thing that will make me happy, whatever it may be. It's all a surprise, I think to myself. It's all a wonderful surprise and on Christmas Day when I've handed them their really really expensive gifts and I'm standing to one side while they ooh and ahh and laugh and hug, they're suddenly going to turn around and say Derek, surprise! We have what you've always wanted! And then they show me a parcel beneath the tree and I fall to my knees, and with trembling hands I slowly tear the paper and lo... the most perfect present ever in the history of the world. And I am happy. This year my mother got me a dart board. She got me a dart board because, obviously, she knows how much I secretly love darts. She has cleverly read between the lines during each of our many conversations throughout the year- conversations in which darts have not been mentioned one single time- and she figured out that what I really wanted for Christmas, the thing that will finally make my life complete, is a great big dart board. Mother, I think it is safe to say you have excelled yourself this year. Well done. My brother and sisters, meanwhile, all got together and arranged an aircraft simulation lesson- where you sit in a cockpit thingy and take off and land a plane without actually, you know, being IN a plane. Well, they ALMOST did that. What they ACTUALLY did was hand me a piece of paper with all this written down. They got me a SUGGESTION for Christmas. Now, to you, this mightn't sound that bad. You might be thinking hey, they didn't know if Derek would be interested in this, so they suggested it, and if he seemed agreeable, they'd go off and book it. And this, dear Minion, would a reasonable thing for you to think. Unless you remember a few years ago where my sisters told me that what they were going to do for me that Christmas was renovate my bathroom. Oh wow, said I. A bathroom renovation, just what I've always wanted. A bathroom renovation as done by two pregnant women with no prior history of bathroom renovations, nor indeed any relevant knowledge of said undertaking. I just couldn't get any luckier. And if you remember that, you may also remember that they never actually got around to doing it. And you may also remember that last year, in some feeble attempt to make up for it, they got me a bath mat and towel. For Christmas. Between the two of them. It wasn't all terrible disappointment and quiet tears when no one was looking, because today was also the day of Doctor Who and The Snowmen! Jenna Louise Coleman is just so PRETTY. But Jenna Louise Coleman is just so PRETTY. I... I think I love Jenna Louise Coleman. I think THAT is what I got for Christmas. God (or whatever random deity you might acknowledge) bless us, every one. Also, next year I might have to send you a present. Something awesome, mind you. Okay so sorry I was just relishing in the moment of getting the first comment on your Christmas blog, as I lead a sad life. But your family, good god. Sounds like mine only, uh... Slightly worse. As for the Snowmen, I LOVED it. I just- IAN MCKELLEN MADE ME SO HAPPY. And Jenna, good lord is she pretty. And what an attitude. My type of girl. I'm looking forward to seeing her in the new year. Any how, aside from the amazing dart board, I hope you had a wonderful day. This year we gave my brother something he wanted many years ago, when he was 5. He asked for a Tractor, trailer and a handbrake one year. He got the tractor and trailer, but not the handbrake. So this year, we took the handbrake out of my other brother's totaled car, and gave it to him, all wrapped up, in a box. Derek, you need to get a sonic screwdriver. Actually, you just need to be the Doctor. Yeah. That'd be cool. And I should be your ninja companion. i got one of my brothers A Clockwork Orange and he got me a new stephen king book!! no one got me a stick though.. So, there was something I thought of earlier, to ask you, and it was brilliant. And it would have been good. But as usual I forgot it so I'll fall back on a stupid question. Did you get Laura a stick for Christmas? Whatever way you want to count it. WELL WE CAN STILL PARTY BECAUSE OF CHRISTMAS. IT'S STILL IN MID-SWING IN THE STATES. In fact, Ashley's about to have her heart wrenched out because she's decided to watch The Angels Take Manhattan. On Christmas. Fool. Oooooh, in which case, I may have. Did everyone who celebrates have a good Christmas? Not that any of you are likely to know what I'm talking about. I had a good Christmas! I still am! A lot of SP fans play Glitch, but I guess not a lot of Glitchen go on Derek Landy's blog. It used to be a really awesome/fun/quirky game, but now it's gone. That's what I'm sobbing about while y'all grieve over Merlin or Dr. Who. Its ok, you don't have to know what I'm talking about. If you're still about, Ashley says hi and she wishes you a Merry Christmas! Christmas presents can be complicated to get but then it's actually quite fun when you KNOW what to get. For example, I was forced to get a present for my brother (last year I didn't realised we had to until Christmas Eve in which a quickly wrapped up a book about some kind of pen pal murderer or something. I miss that book.) so I generously got him Spongebob Squarepants trousers, black eyeliner (or 'guyliner' as some call it) and black nail polish. My brother's reaction? He screamed. What did YOU get for you brother, Derek? How did I know this would be here??? Derek, I read that Zaf any NJ might be in your book.. Of course, you'd just murder Zaf... But if she is, I rather think that Zaf needs an elder sidekick *couch* me *cough*. And if you do, I will personally mail you a fez. ... Jenna is so lucky. YAY. I STILL HAVE YOU. GOOD OLD SCOTTISH YOU. OH HEY can you read a story my mate and I are making??? Doctor-Derek!!! Please come on!!! And just have a chat! PLEASE. IT'S CHRISTMAS!!! And is Lord Vile Skulduggery's true name??? I did not! I STOPPED the idiots! Dont you dare being telling Master Derek lies bout me! CAN I BE IN THE BOOK? PLEEEEEASE???? The Doctor Derek deserves the truth. It nearly ended about nine times. Okay, that looked like a Tardis... And now it doesn't. What. Anyway... I still think Lord Vile is Skulduggery's true name... It makes sense. Ultimate power, and such. MASTER DEREK COME CHAT? It is Christmas! You are anything BUT innocent. YOUVE MADE GENOCIDE ON MULTIPLE OCCASIONS. AND YOUVE SACRIFICED THE DOCTOR DEREK MULTIPLE TIMES. Isn't anyone going to back me up? It was the bet solution not a perfect one. Why the hell would i sacrifice DEREK? I actually like him! you'll forget by morning. I ought to just arrest you! *best (sorry, im on Tani' laptop, the ss key is ticky. YOU SACRIFICED HIM A COUPLE POSTS BACK. YOU LAID HIM ON AN ALTAR AND STABBED HIM. how is that NOT sacrifice. When the hell did i put him on an altar?! Why is it called boxing day? It is very confusing. I never bloody put him on an altar!!!!!!!!!! Woah, I just realised - I am such a hypocrite. Maybe you put all your Chritmas decorations away in a box? Or box up the present that you don't want? Yesterday, Christmas Day, was the hottest ay in Welly since 1934. And now im even FURTHER north, so it is HOTTER. Im frozen! Winter in America! It's not hot here... It's wet. p.s I've started on the story that most of you are in. oh and what you look like. Zaf, you'd do it because you're CRAY CRAY. But let me tell you... The best of us are. Except, well, the CHRONICALLY insane ones like you... Or am I kidding?? Boxing Day is traditionally the day following Christmas Day, when servants and tradesmen would receive gifts from their superiors. ITS SO UNFAIR we get the dw christmas special LAST. Us, and Australia. I still have to wait till tonight. This is gonna make me son hysterically!!!!! I was watching it over again with my almost step sisters and they were practically crying. And they don't even know who Amy and Rory are. That last episode was just..... cruel. Especially for me, Amy & Rory, and the Doctor! Poor Doctor. Nobody can be better than Amy. THIS MAKES ME SOB. WHEN THEY JUMP. The angels take manhatten episode was genius. Pure cruel, sad, awful, mean, unfair, adjective, anotherdifferentadjective, genius. But, last time I checked, by the end of the episode she was a DALEK! Val, you made my head explode. Derek would LOVE that, and it would be just so. awesome. Can you guys please stop talking about angels take manhattan? I haven't seen it yet . Sit down with a hot choccy, a blanket, and a box of extra-large tissues. Adra, just a question, since when were you a.... duckter? And the special is on!!! On the first day of Christmas, Derek gave to me: an epic book about Skulduggery. On the second day of Christmas, Nixion gave to me: two cryptic emails and an epic book about Skulduggery. On the third day of Christmas, Valereno gave to me: three fresh blood samples, two cryptic emails and an epic book about Skulduggery. On the fourth day of Christmas, Staraptor gave to me: four banana statues, three fresh blood samples, two cryptic emails and an epic book about Skulduggery. On the fifth day of Christmas, Helena gave to me: FIVE MONKEY JUMPHUGS! Four banana statues, three fresh blood samples, two cryptic emails and an epic book about Skulduggery. On the sixth day of Christmas, Laaav gave to me: six live chicken drawings, FIVE MONKEY JUMPHUGS! Four banana statues, three fresh blood samples, two cryptic emails and an epic book about Skulduggery. On the seventh day of Christmas, Phoenix gave to me: Seven mirrored nicknames, six live chicken drawings, FIVE MONKEY JUMPHUGS! Four banana statues, three fresh blood samples, two cryptic emails and an epic book about Skulduggery. On the eighth day of Christmas, Memerald gave to me: Eight werewolf stories, seven mirrored nicknames, six live chicken drawings, FIVE MONKEY JUMPHUGS! Four banana statues, three fresh blood samples, two cryptic emails and an epic book about Skulduggery. On the ninth day of Christmas, Lucy-Anna gave to me: nine over-flowing bookshelves, eight werewolf stories, seven mirrored nicknames, six live chicken drawings, FIVE MONKEY JUMPHUGS! Four banana statues, three fresh blood-samples, two cryptic emails and an epic book about Skulduggery. On the tenth day of Christmas, Zafmira gave to me: ten diabolical plans, nine over-flowing bookshelves, eight werewolf stories, seven mirrored nicknames, six live chicken drawings, FIVE MONKEY JUMPHUGS! Four banana statues, three fresh blood samples, two cryptic emails and an epic book about Skulduggery. On the eleventh day of Christmas, Missy gave to me: eleven shouted greetings, ten diabolical plans, nine over-flowing bookshelves, eight werewolf stories, seven mirrored nicknames, six live chicken drawings, FIVE MONKEY JUMPHUGS! Four banana statues, three fresh blood samples, two cryptic emails and an epic book about Skulduggery. On the twelfth day of Christmas, the Bloglandians gave to me: twelve weird conversations, eleven shouted greetings, ten diabolical plans, nine over-flowing bookshelves, eight werewolf stories, seven mirrored nicknames, six live chicken drawings, FIVE MONKEY JUMPHUGS! Four banana statues, three fresh blood samples, two cryptic emails and an epic book about Skulduggery. Tadaaaaa! Again, terribly sorry of you weren't mentioned. You were definitely going to be mentioned, except that ZAFIRA called dibs on the tenth. Another one of her diabolical plans. 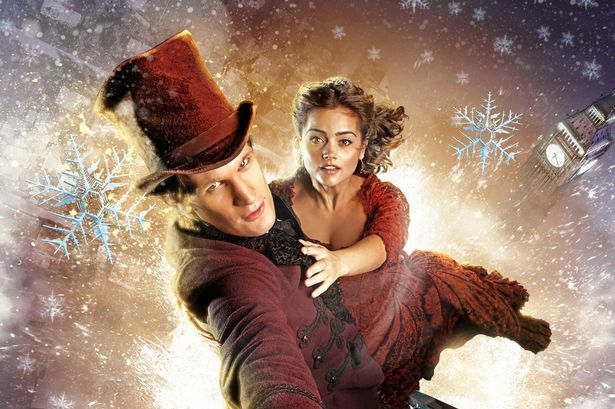 i STILL havent seen the christmas special for DW!!! DONT TALK ABOUT MERLIN! I havent seen ANY of the most recent series. Curse you, New Zealand tv, curse you. OMG CALI IT RUINED MY CHRISTMAS!!! So... how do I see episode ONE? Does that site have that too? ... is the first episode at the start supposed to have morgana and uther, one of which is dead and the other is evil? OMG FANG IS SO AWESOME!!!!!!!!!!!! no one know what the keck you're talkin about though..
Alice is so, so, so, awesome right now. Are you being sarcastic or not? Leave me to my personal obsession! I don't really know why it said season 5... but thats the right one.. I got the Pandora Hearts anime boxset for Christmas so I can watch it. Whenever. I. Want. Your sin, it is, your very existence! OOH!! haha sorry!! that's the one I gave you WHOOPS! Sharon just called Break "Blake"
Where did you go off to? Did I scare you guys away with my Pandora Hearts rambling? Oh hell why do more people die?! I'm re-watching happy Dr. Who. Before Rose Left. Am I going to be first?